TOPEKA — A state panel ruled Monday that Republican 4th District Congressman Ron Estes can be listed on the Aug. 7 primary ballot as “Rep. Ron Estes” to avoid confusion with a GOP challenger by the same name. 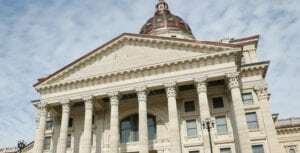 It also ruled that a Republican candidate for the 85th District in the Kansas House can stay on the ballot, despite contradictory evidence about whether or not he actually lives in the district. But the panel ruled that a Massachusetts man by the name of Vermin Supreme cannot be a candidate for attorney general, citing a recent Shawnee County District Court ruling that said residency in the state is an implied requirement for statewide offices, even if it’s not specifically spelled out in statute or the Kansas Constitution. 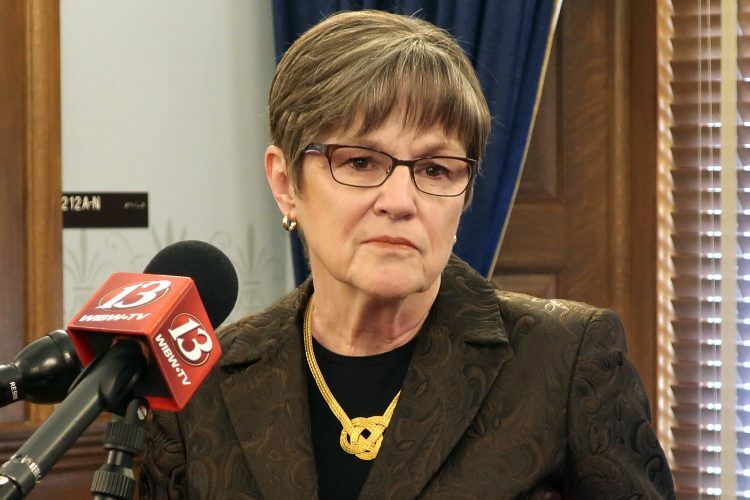 Those three cases went before the State Objections Board on Monday as a result of challenges that had been lodged shortly after the June 1 candidate filing deadline in each of the three races. That’s a board made authorized under statute that is composed of the secretary of state, lieutenant governor and attorney general, or their designees. All three of those elected officeholders are Republicans. On Monday, Brant Laue, chief counsel for the governor and lieutenant governor, sat in for Lt. Gov. Tracey Mann. Deputy Attorney General Athena Andaya sat in for Attorney General Derek Schmidt. Secretary of State Kris Kobach appeared in person. 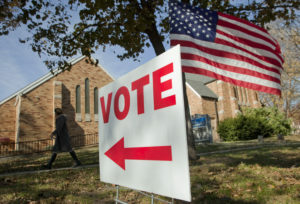 On May 31, a Wichita man by the name of Ron M. Estes filed to run as a Republican to challenge incumbent U.S. Rep. Ron Estes, who has alleged that it was a deliberate attempt to confuse voters. Rep. Estes is a former state treasurer who won a special election in the 4th District in 2017 after former Rep. Mike Pompeo was named to head the CIA in the Trump administration. In response, the Kansas secretary of state’s office decided to list his name on the ballot as “Rep. Ron Estes,” and the other candidate as Ron M. Estes, in order to distinguish the two from one another. But one of the two Democrats running in that race, Laura Lombard, filed an objection citing a state statute that generally prohibits the use of titles, prefixes and suffixes that are symbols of accomplishment, occupation or qualification. Lombard argued it wasn’t necessary to use of the title “Rep.” in the 4th District primary because the two men could distinguish themselves by using their middle initials. She said using “Rep.” in front of the incumbent’s name would not only give him an unfair advantage in the primary, but that the name would have to appear the same way on the Nov. 6 general election ballot, giving him the same advantage when he faces a Democrat. 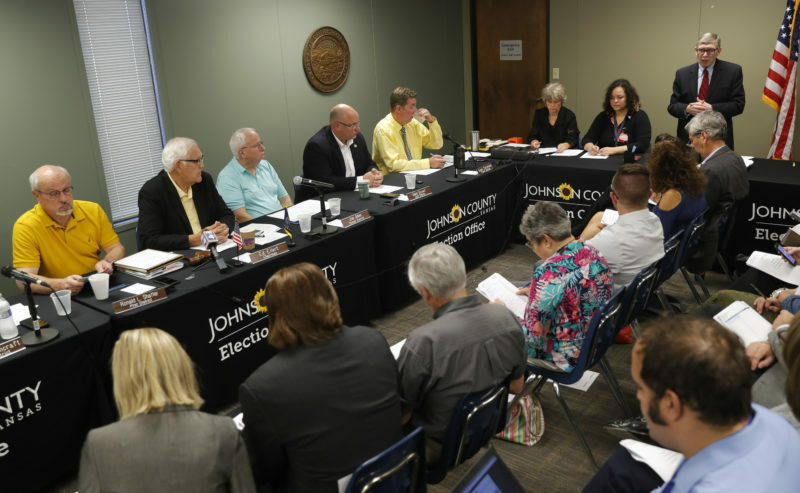 The board, however, disagreed, although Kobach indicated it could revisit the issue, if necessary, after the primary election. In another hotly contested dispute, Democrat Monica Marks, who is running in the 85th District House race in Wichita, questioned the residency of her Republican opponent, Michael Capps, who had earlier filed to run in a different House race. The outcome of the dispute was important because Marks and Capps are the only major party candidates in that race. It’s an open seat currently held by Rep. Chuck Weber, a Republican who is not running for re-election, and if Capps had been taken off the ballot, the district almost certainly would have flipped to the Democrats. Marks was represented at the objections board by an attorney, Rep. Vic Miller, D-Topeka, who presented numerous documents purporting to show that although Capps is listed as the owner of a home in the 85th District, he was actually still residing in the 97th District, where he had earlier filed to run. He also said the house had been foreclosed upon and that it was set to be sold at auction later this month. “When it comes to claims of residence, Mr. Capps is a liar,” Miller said. In fact, Miller argued, although Capps claimed to have moved into the 87th District House on May 5, he filed paperwork with the secretary of state’s office as late as May 16 appointing a campaign treasurer for the 97th District race, indicating he was still declaring that home as his address. Miller also said Capps had a history from previous legislative races of abruptly shifting his residence from one address to another. Capps was unable to explain that discrepancy, saying it may have been a “technical oversight,” and that the form may have been submitted electronically by someone working for his campaign. He did say, however, that the foreclosure was part of a business-related bankruptcy that came about when he sold a business, and that he has taken steps to redeem the house before it is sold. Miller argued that the definition of “reside” was simple. “It’s where you live,” he said. “Residence is a lot more than saying you live there. You have to live there,” Miller said. The board, however, said the definition is more nuanced than that. It said there are two components to being a resident at a particular place: actually living there; and the intent to return there, even if the person leaves temporarily. Laue said there is nothing in Kansas law to prohibit a person from changing his or her intent, nor is there anything that says a person can’t change addresses on a frequent basis. House Minority Leader Jim Ward, D-Wichita, issued a statement after the ruling calling it a partisan decision. “Republicans proved again they’re incapable of fairness and objectivity by approving the candidacy of Michael Capps,” Ward said. In another case, the objections board upheld an objection from the Kansas Republican Party to reject the candidacy of a man by the name of “Vermin Supreme” to be listed as a GOP candidate for attorney general. Supreme had listed an address in Rockport, Mass., when he filed for the office on June 1, telling reporters at the time that he was taking advantage of Kansas’ lax laws regarding qualifications for certain offices. 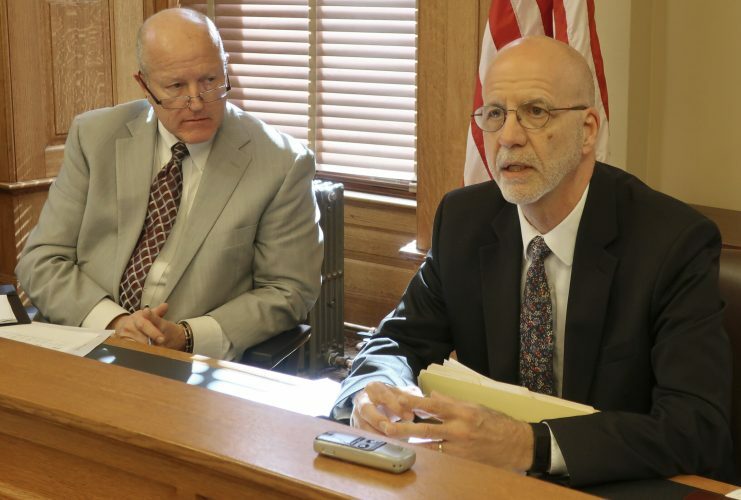 There are currently no statutory or constitutional qualifications required for people to run for attorney general, including residency, although Kansas lawmakers did enact new qualifications this year, which take effect Jan. 1, 2019. In a similar case involving candidates for the office of governor, however, a Shawnee County District Court judge ruled that a residency requirement is implied in the law because it is mentioned in the standard petition forms when people file for office by collecting petition signatures. Rep. Boog Highberger, D-Lawrence, attended the objections board meeting, serving as local counsel for Supreme, but he did not speak during the proceeding. Instead, another attorney took part by phone, arguing that the Shawnee County ruling was wrong, and that the board should adhere to what is in current law and the Constitution. The board, however, voted 2-0 to sustain the objection. The attorney general’s office abstained from the discussion and the vote. Ed.note: Updated at 6:33 p.m.